An independent guy who loves pencils, writing about them, reviewing them, promoting the use of them, sharpening them... He loves the smell of them, the feel of sharpening and using a vintage pencil... You get the idea. 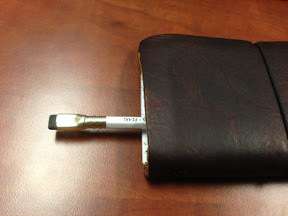 I spent a little time last night writing with the Pearl and I kept on being distracted by the finish on the pencil. It feels amazing! It reminds me of the feel of a Tombow Mono. It has the barrel width that is pleasing to hold and the smooth surface of the paint is nice. Ill be using the Pearl for notes during a meeting this morning and I thought of one thing, you may recall that I prefer the pink erasers. I think that maybe the Pearl is a little bit feminine with the pink eraser. What do you think? I do like the look of it peeking out of the notebook though with the black eraser. 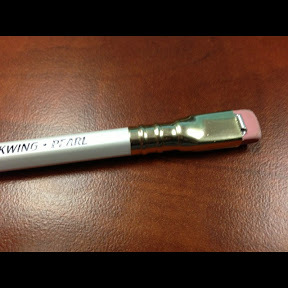 I haven't said all there is to say about the Blackwing Pearl. Just for grins: how does it look with the white eraser? And since the Pearl is so different externally, I have to wonder how the colored erasers would look . . .
Millicent, you are a genius. It looks the coolest with the white eraser on it. I will include a photo on Part 3. I have been meaning to get a couple of packs of the green and other colored erasers from pencils.com but I never remember, I think the green would rock. 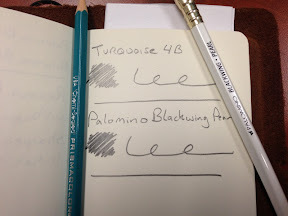 How does the core compare to the other palomino blackwings? 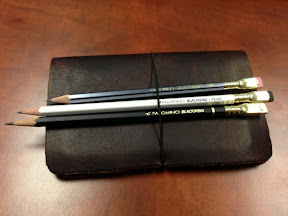 Want me to review your pencil or pencil related product?